Terrance "Terry" Wilding has had an adventurous career in teaching and administration at several schools for the deaf. He grew up in Gooding, Idaho, as a member of a large strong-Deaf family, led all three branbches of the Student Body Government at Gallaudet University (Speaker of the Student Senate, President, and Chief Justice), and served an internship under U.S. Senator Steve Symms. He has taught and served in the administration of the Texas, Arizona, and New Mexico schools for the deaf. 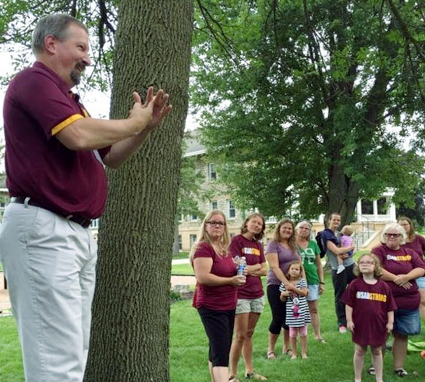 In May 2016, he was appointed new superintendent of the Minnesota State Academies for the Deaf and the Blind, the first Deaf "super" to head both schools. Igrew up in Gooding, Idaho and attended the Idaho School for the Deaf and the Blind. My dad was a teacher there so we all attended ISDB. I'm one of 9 deaf children in my family and we believe we are one of the largest "100%" deaf families in the world. So far, we only know of one other family that has 9 deaf children (the Frelich family of North Dakota). I'm the middle child in my family (5th out of 9). I have 5 sisters and 3 brothers. My dad still lives in Gooding and runs the ISDB museum in his spare time. I enjoyed growing up in Gooding —we had a good community that supported us—many deaf families lived in Gooding and the town was very familiar with our needs. Although we grew up prior to the laws regarding equal access, interpreting, and so forth, we had good levels of access in the community due to the interactions between the community and our school. I grew up participating in many community activities, including athletics, scouting, church activities, and so forth. At ISDB, I had the opportunity to participate in many school-sponsored activities. Although we were a small school (my graduating class only had 5 students), our school provided us with many experiences, including Student Body Government, JrNAD, Boy Scouts, Athletics, Peer Counseling, Leadership Development, and so forth. Those experiences helped shape me into who I am today. When I graduated from college, I moved to Austin, Texas and started looking for jobs. At that time, an opportunity opened up for me to teach in the Independent Living Skills program on the old East Campus of Texas School for the Deaf. I applied for the job and got it. That experience helped me realize that I enjoyed working with deaf youth and teaching. After one year, I returned to school to get my Masters in Deaf Education from Western Maryland College (currently McDaniel College). This experience of working with deaf youth with special needs, as well as working with my colleagues and supervisor who mentored me, helped me change my perspective. Prior to this experience, I had thought of going into government work or advocacy work, but my prior experience as an intern at the U.S. Senate under Senator Steve Symms of Idaho made me realize that I didn't enjoy working alone without full access to communication. (this was pre-ADA). My entire family also has some connection to education—our parents are educators and I think this was ingrained into us as we grew up. My dad taught for 37 years and my mom was a great community advocate for the deaf community in Southern Idaho. After graduating from Gallaudet, I worked at the Texas School for the Deaf for a total of 2 years (split between work at TSD and my graduate studies at WMC). When I was a student at WMC, I worked in the Student Life Department at the Northwest Campus of Gallaudet University. After graduating with my MA in Deaf Education, I got a job at the Arizona Schools for the Deaf and the Blind in Tucson, Arizona—starting out as a middle school teacher and eventually moving up to become the supervising teacher for their high school department. I worked at ASDB for a total of 7 years. During that time, I also earned a second Masters in Educational Leadership. In 2002, I moved to the New Mexico School for the Deaf and started working as a principal there. I stayed there for 14 years, supervising different departments, ranging from Grades 3-12, but during my last 9-10 years, I primarily focused on the Middle School and High School departments, including Transition and Athletics. I participated in their leadership team and helped develop programs to improve our school's educational program and extracurricular programming. I'm not the first deaf superintendent in MSAD's history. There were a couple of interim superintendents who were deaf during the early part of the 20th century and Dr. Kathy Jankowski was the superintendent for a short time in the 1990's. I am the first deaf superintendent to supervise both campuses (MSAB and MSAD). In the early 2000's, the positions of superintendents for both campuses were combined. Since that time, all of the superintendents were hearing. I'm the first deaf superintendent to be hired since this decision was made. In my leisure time, I enjoy outdoor activities (camping, hunting, fishing) and reading. I'm a self-professed bookworm and I read as much as I can. Otherwise, I enjoy spending time with my wife, our children, and our pets. We have 3 deaf children—Cheyenna, Caldonia, and Tyrel. We also have two deaf dogs and two cats. When I moved to Minnesota, I was struck by the progress that deaf and blind people in Minnesota have made in improving the lives for Deaf, Hard-of-Hearing, Deafblind, Blind, and Visually Impaired individuals. In Minnesota, there are many services, community groups, laws, and other supports for our students and alumni. I've enjoyed learning about all of the services available and meeting with the community here in Minnesota. I look forward to many more years of collaboration and support. Thanks to John P. Mathews of Faribault.